Google's instant previews for video sites weren't very useful because most video sites use Flash and the software that generates thumbnails can't handle Flash. That's probably one of the reasons why Google replaced the standard screenshots with short clips from the videos. By default, the sound is muted, but you can change this setting. The feature is also available at Google Video next to some search results. "When it comes to videos, people want to spend less time searching and more time watching. That's why we added an enhancement to Instant Previews—the ability to preview videos. Click once on the magnifying glass next to the title of any video search result in universal or video mode. For some videos, you'll now be able to play through a set of four short segments from the video to see if it’s what you’re looking for (video providers have to opt to make the previews available, so you won't find it for every video yet)," explains Google. Even if Google announced this feature a couple of weeks ago, it's still spotty, so it may not be available for you. 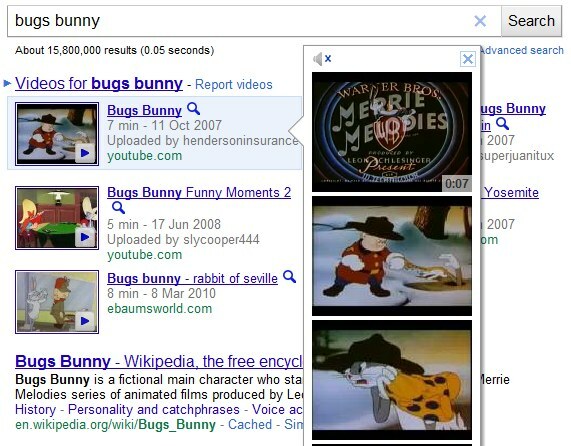 You can also try Bing's Video Search, which offers a similar feature that probably inspired Google. I just tried it, but I think this might work better on YouTube. There's a Chrome extension that previews videos but not the sound. Amazing feature they launched. @Jason: both sound and video is working in my Chrome. In Bing video's its working but for Google Video's that magnifying glass is not available. I just wanna to say "google is the best operating system". This is a good feature because it prevents the user from having to click back and forth if the video isn't what they were looking for. It probably was inspired by Bing. It's good that the search engines continue to try and provide helpful new services. this is quite amazing, even by the high standards of google. impressive.